Sunil Gavaskar felt that skipper MS Dhoni no has a “balancec” side at his disposal and that’s why the team was getting desired results in Twenty20 series. Melbourne: The sublime touch that he is in, Virat Kohli can bat even at midnight without switching on the lights and still score runs, Sunil Gavaskar said on Friday, eulogising the young Indian batsman. A rampaging Kohli continued to torment the Australians, hitting another quick-fire half-century in India’s second win in the Twenty20 series on Friday. “He is setting the bar higher for the future players. He is in fantastic form.. form which the players dream about. he can even bat at midnight without light and still bat well. The Australians cant get him out. They will have to wait for him to commit a mistake,” Gavaskar said. “I would not bowl to both of them. Rohit kills you with tickle and Kohli can punch you to death. Either way you are going to die,” he told NDTV. The former Indian opener also suggested that India must not tinker with the batting order even as the series has been claimed by them. His reply came when he was asked if Yuvraj Singh should be promoted to number three so that he can get some match practise under his belt. Gavaskar felt that skipper MS Dhoni now has a “balanced side” at his disposal and that’s why the team was getting desired results in Twenty20 series. “He has got now Yuvraj, Ashish Nehra, Hardik Pandya in the side. He has plenty of bowling and batting options. It has eased off the pressure on him. Bhajji (Harbhajan Sigh) is sitting on the bench which means it is a very good selection. The balance is terrific. Pandya can bat at number seven and can bowl. Even if a bowler is hammered around, Dhoni can go to the other bowler,” Gavaskar opined. Australia today rested Steven Smith and David Warner so that they can begin preparations for the New Zealand Test series but Gavaskar was not impressed. “Anybody who is taking it lightly, representing the country, deserves the result they get. Always play with your best players. It smacks of arrogance,” he said. Sunil Gavaskar believes that under Virat Kohli, India look determined and have found the right balance in all departments. 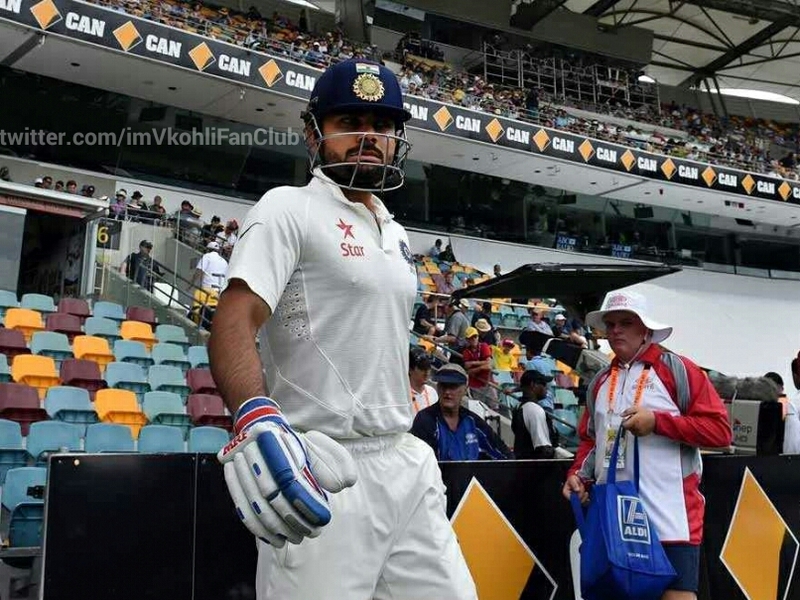 Sunil Gavaskar believes Virat Kohli’s Team India is looking determined and balanced. Hailing India’s series levelling win against Sri Lanka in the second cricket Test as a start of a bright future, former captain Sunil Gavaskar said that the Virat Kohli-led side not only looks “determined” but has also found the right balance in all departments. Trailing 0-1 in the three-match series, India humbled Sri Lanka by 278 runs at the P Sara Oval to deny Kumar Sangakkara a fairytale ending in his swansong. Gavaskar is impressed with India’s team effort. “It tells you how they determined they are to take Indian cricket forward. The way they have played this Test match and the way they have combined… this was a real team effort. In a win there will always be a couple of people who have done a bit better than everybody else, but I think it’s been a combined team effort. And that’s what it tells you, it’s the determination to take Indian cricket forward,” Gavaskar told NDTV. “The real Test will come outside sub-continent. But the way they are shaping up for it, certainly makes you feel optimistic. Because they have got a very good balance, very good batting, their bowling looks balanced and their fielding has been quite outstanding. The close-in catching has been quite superb. “So, I think there is all the more reason for Indian cricket lovers to be optimistic about the performance of the future of this team,” he added. It was Kohli’s first win as Test skipper and Gavaskar also sees a good future for the young leader. “Just like a batsman wants a hundred under his belt, a captain wants a Test win under his belt and that’s what Virat has had. I would believe that this would be the first of many wins that he will have under his leadership,” he said. Gavaskar did see Murali Vijay’s absence from the final Test due to an hamstring injury as a blow to India but also welcomed Cheteshwar Pujara’s re-entry into the playing XI. “Vijay’s injury is a bit unfortunate, because he batted so well. He was the one who took the attack to the opposition and thus allowed Rahane to play his natural game. So Vijay’s injury is a big blow for India. But I think Cheteshwar Pujara is equally capable of the big runs and maybe long overdue for a recall to the Indian playing XI,” he said. “The pitch in the next game will decide the formation of the side, but I don’t really foresee too many changes in the team. Maybe a Bhuvneshwar Kumar in place of Stuart Binny,” he added. Not undermining Sangakkara’s contribution to the game and Sri Lanka, Gavaskar did not forget to mention Muttiah Muralitharan’s service to national cricket. “Murali’s contribution to the game cannot be overlooked. Look at the number of matches he spun Sri Lanka to a win. Sanga did play some stellar innings for Lanka, gave them plenty of runs but he did that along with Mahela Jayawardene and Tillakaratne Dilshan. “Murali often did everything on his own. He was one bowler picking 6,7,8 wickets for Sri Lanka. Difficult to judge anyone as the No.1. But the combination that was there was terrific,” said Gavaskar. Sanga’s 15-year-old illustrious career came to an end as Sri Lanka face a must-win battle in the final Test against India. Gavaskar admitted that the road ahead will not be easy for the islanders sans Sangakkara. “But now they are going to have a major problem in their hands, because now we have seen them crumble this morning. It was quite unbelievable. Now Sri Lanka is really going to struggle with batting,” he said. The batting legend though was not surprised at Sangakkara’s timing of retirement. “Not surprised, because he had made the Sri Lankan board known from before. He made them know, it was they who wanted him to carry on. He wanted to quit at the end of the World Cup in Australia, but the SLC made a request for him to play a few matches. “He accepted to play two Test matches against Pakistan and two against India. But now it is a bit difficult for Lanka in the deciding Test. The next game without Sangakkara will be very, very difficult for Lanka to win it,” he said. Sunil Gavaskar says that Virat Kohli – who scored a career-best 169 against Australia at MCG – is firmly on the path to greatness but needs to further calm himself to attain glory. Virat Kohli has made the journey from talented youngster to batting mainstay very quickly. His career best 169 on Day 3 of the MCG Test was his third century of the current Test series Down Under and another example of the 26 year old’s incredible natural batting talent. When Kohli was just a few years old in international cricket someone had asked the question, can this young man be the next Sachin? It’s a question that will be quickly dismissed by most experts even now. But don’t be surprised if that same question is asked by someone, somewhere very soon again.